An image of Omran Daqneesh, dusty and bloodied in the back of an ambulance, did not suffer grave injuries from Syrian government forces, after all - in fact, the whole story was an elaborate lie. Covered in dust and bruises with hair disheveled from having survived a blast, the blood beginning to crust over half his face, a seeming placidity - hands anchored on his legs, all-but unmoving - could not mask the stoic trauma in little Omran Daqneesh's eyes. Gazing hauntingly from the back of an ambulance in Aleppo in August 2016, Omran's image snared the heartstrings of the world - even those previously hardened to the hopelessly tangled morass in Syria - transmogrifying into a single human form the suffering of innocent Syrians at the whims of entire nation-states embroiled in proxy war upon war in the name of political squabbles. 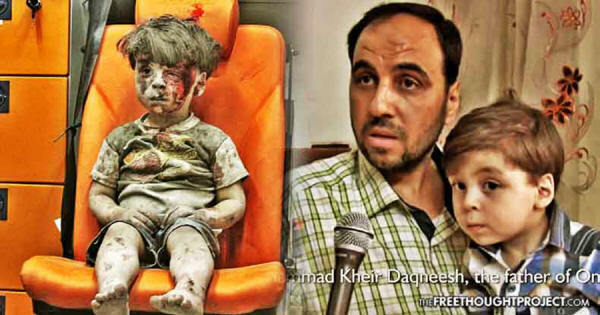 But, while the West took up Omran's cause, Westerners did so under the pretense the child had been bloodied by an airstrike or missile launched by the forces of Syrian President Bashar al-Assad or their allies from Russia - his image rekindling the fire of contention propaganda designed to support the United States' goal of regime change. But it was a lie - from mass media's parroted claims (like CNN?) the boy had escaped an airstrike within an inch of his life, to bandages eventually wrapped around Omran's head - virtually none of the narrative stemming from the starkly persistent image bore the weight of truth. "We did not find out how the incident happened," Mohamad Kheir Daqneesh, Omran's father, told reporter Kinana Alloush and others in interviews this week. "I pulled my family members out of debris. Omran was with me, while White Helmets took him away and started taking photo of him." Mohamad Kheir Daqneesh, noting the sound of fighter jets or missiles did not precede the blast which ultimately killed Omran's 10-year-old brother, explained he had to shave the boy's head and ferret him away from overwhelming media attention - and from rebel fighters and sympathizers who sought perhaps to wrest the symbolic child from the relative safety of his family. Journalists allied with al-Nusra Front - variously, Fatah al-Sham or Levant Liberation, an offshoot of al-Qaeda - demanded the father adhere to the narrative Assad was responsible for Russians bombing the neighborhood, and, thus, their suffering and tragic predicament. They even offered sizable sums to sweeten the pot. He refused - on principle, as well as on the basis of knowledge likely some contrary was true. In fact, the attempt to wrangle a narrative favorable to the U.S.-led coalition hasn't ceased - even amid the emergence of the family's actual plight, pro-Western media outlets like the Guardian and Washington Post maintained speculation and withheld details disputing the original maudlin horror evinced in the August 17, 2016, image of Omran in the ambulance's orange chair. Where Kinana Alloush and other journalists, interviewing Daqneesh with Omran by his side - now clean cut and hinting smiles - listened intently to the man fed up with misinformation circulating for almost a year, Western corporate media insisted there could be no way to verify whether coercion forced him to speak out. Mohamad - gasp - supports the rule of Assad. War's messes cannot be encapsulated so facilely in the resigned, dusty face of a single child - not when thousands of children whose stability, limbs, life, and homeland have been ripped to shreds - but go unnoticed by the same corporate media backing interventionist policy wreaking that havoc in the first place. Omran, it turns out, suffered only minor injuries - not even severe enough to warrant head bandages, much less a footnote in history as the poster child for why the West must oust Assad - and he left the hospital after receiving first aid to return to whatever remained of their home in Aleppo. "He only sustained minor injuries, but the militants exaggerated this fact. They said on numerous occasions via their media that he died, until finally admitting that he's alive. They are not to be trusted," the elder Daqneesh asserted. I never had any dealings with their organizations and I never accepted their so-called humanitarian aid." Months of hiding, dodging further unwanted attention, plagued Daqneesh - until ire at brazen manipulation of his son boiled over into statements with journalists clarifying Assad and the Russians should not bear blame. Terrorists - some armed, trained, backed, and laughably reclassified by the West and its allies as 'moderate rebels' - still aim to depose Assad and dominate Syria. In some places, they do. And while it would be equally as farcical to sterilize atrocities committed by Syrian and Russian forces, denying Western and American complicity in the horrors besieging civilians belies a pomposity in politicized warring - with children like Omran unknowingly symbolizing two fundamentally differing justifications for its continuance. Omran isn't Syria. But because he is Syrian, the ugliness of conflict in the Middle East - stoked by a laundry list of geopolitical, religious, and other conniving agendas - found shameless solace in emblazoning his image on propaganda conveniently supporting each, individually. If Omran Daqneesh is to be a poster child of this war, then let the five-year-old grace only posters calling for its end - for a return to a life Westerners might not be familiar in its normalcy, but which suited the majority of Syrians. If you wish only to never see another Omran - less so, his counterparts, who were fortunate enough to escape the additional burden of the international floodlight, but who suffered worse fates - then war must end. Troops must be delivered back to their families. Death must cease to be a commodification of the need to intervene in affairs of sovereign nations. Otherwise, there will be more Omrans - worse, there will be an interminable list of children lost to war, whose names and faces only their families will mourn.